The 23-year-old finished runner-up to South Korea’s Yun Sungbin in today’s event, clocking a cumulative time of 3:22.18. Last week, the Court of Arbitration for Sport (CAS) dismissed the appeals of all 45 Russian athletes hoping to be cleared to compete. The announcement, delivered by CAS secretary general Matthieu Reeb, meant athletes such as Olympic skeleton champion Alexander Tretiakov were barred from participating at Pyeongchang 2018. After winning the silver medal, Tregubov spoke of his disappointment at not having some of his team-mates with him to share in his success. “Winning an Olympic silver feels absolutely incredible,” he told TASS, Russia’s official state news agency. “The training was difficult like never before, but I’m glad that I was able to cope with all difficulties and nervousness and became a silver medalist. “It’s sad that my teammates could not be here by my side. “I fought not only for myself. 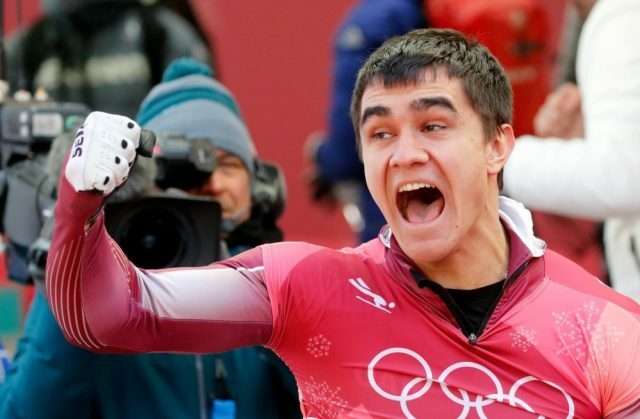 “Nikita was alone in Pyeongchang [as the International Olympic Committee (IOC) did not invite all Russian skeleton coaches],” he said. “We gave him advice by phone. “We analyse videos that he had sent to us. “We tried to help him remotely. The CAS ruling, announced just hours before the Pyeongchang 2018 Opening Ceremony held last Friday (February 9), also prohibits Olympic skeleton bronze medalist Elena Nikitina from competing here. Russian athletes are competing as Olympic Athletes from Russia due to a “systemic manipulation” of the anti-doping system at Sochi 2014. This ban will be lifted before the Closing Ceremony, however, if the IOC judge Russia have acted within the “letter and spirit” of their participation requirements.